It is truly a mystery how a Cycladic island so close to the overcrowded Greek capital of Athens could remain one of the best destinations in the Aegean to escape from the crowded scenes. Kythnos is a peaceful, off the beaten track, Cycladic paradise waiting to be discovered for all its treasures: serene landscapes, golden sunsets, charming squares, labyrinth streets, traditional red roof houses, colorful gardens, ancient sites, thermal springs, impressive cave and hospitable people. With so many villages and beaches you will get a sense of isolation even during the high season. Rightfully this idyllic retreat is preferred by families and travelers seeking for serenity and peacefulness, while it is considered one of the favorite weekend destinations in Greece, being one of the few Cycladic islands accessible from two Athenian ports (Piraeus and Lavrion). 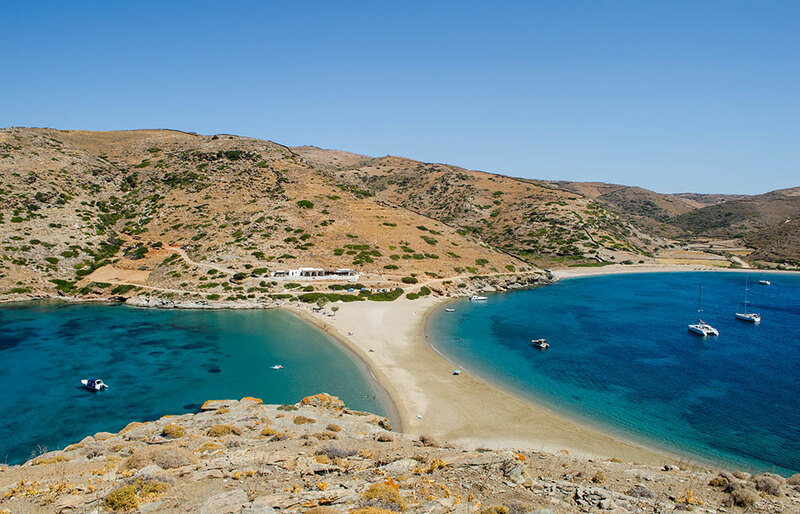 Kolona beach: is one of the most memorable beaches of the Aegean due to its characteristic shape - this stunning beach connects Kythnos to Agios Loukas islet by a narrow strip of sand with sapphire waters on both sides. Its idyllic scenery attracts travelers who seek an exotic paradise to relax. The beach is not organized with only a few trees to provide natural shade. However there is a restaurant nearby where you can enjoy local delicacies and admire the magnificent view of the beach. 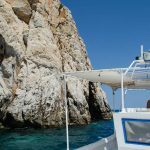 Kolona is 3 km from Chora and can be either accessed by a narrow and rather steep dirt road or by boat. Castle of Oria: is one of the hidden gems of Kythnos, located on an altitude of 250m at the northwest of the island. This impressive medieval castle was built in the 7th century BC by the Venetians and remained the capital of the island till the 16th century. It was a big fortified capital with over 100 buildings inside and outside of its walls, and more than 500 people in population. In 1537, Turks invaded the castle. As legend has it, the pirate Barbarossa tried to conquer it for 12 years, until finally he made a Turkish man wear female clothes and enter the castle, let by the governor’s beautiful daughter; the Turks all entered and slaughtered everyone. So much blood was poured into the sea, that it was said the canal between Kythnos and Kea turned red, so they even named the beach underneath “Sklavou” beach (ie. “Slave” = trans. Greek).The daughter could not bear what she has done and jumped from a rock and killed herself. The castle was named after her (Kastro Tis Orias = Beauty’s Castle). Thermal Springs: can be found in the area of Loutra. Kythnos is also called Thermia due to its thermal springs. The first to recognize their therapeutic properties were the German doctors of King Otto and Queen Amalia, who suggested she should visit the springs to treat her infertility problem. Agioi Anargyroi spring is located inside the spa building that was constructed in 1857 for Queen Amalia, while Kakavos spring is an outdoor spring just 50m away from Agioi Anargyroi. These springs flow into the sea and those who swim there enjoy their healing properties. Moreover, in the southern part of the beach you will also find a small natural pool formed by rocks where the hot water of Kakavos spring mixes with salt water. The pool’s temperature remains constant throughout the year at 52° Celsius, making it ideal for night and winter swims. Katafiki Cave: is one of the greatest attractions in Kythnos known for its unique rock formations and beautiful stalactites and stalagmites. It is also one of the biggest caves in Greece with fascinating labyrinthine corridors covering an area of approximately 3,500 sq.m. It owes its name“Katafigio” (Refuge = trans. Greek) due to the fact that it operated as a refuge for the inhabitants of the village during the years of pirate invasions, the Franks and the Turkish occupation, as well as the Second World War period. Panagia Kanala: is one of the most important monuments of Kythnos, built in 1869. This peaceful church is known for its exquisite architectural style. 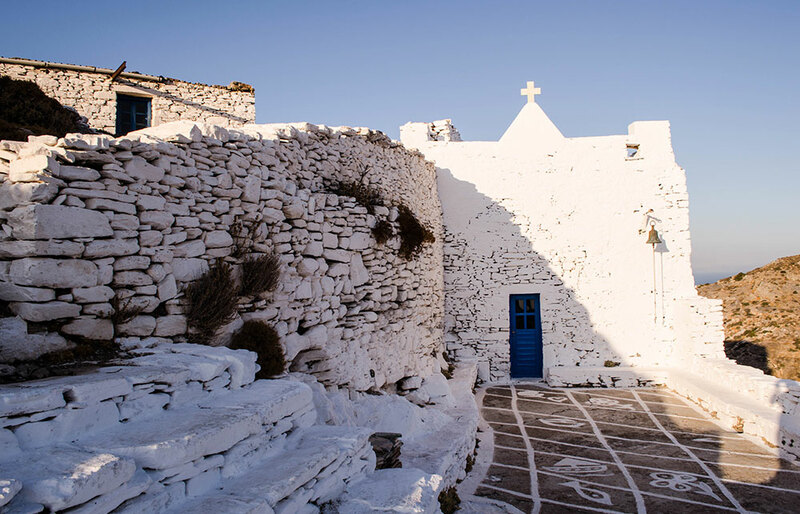 Vivid colors, stone arches and a gorgeous garden surround the idyllic church that is situated on the seafront of Kanala village, overlooking Serifos. 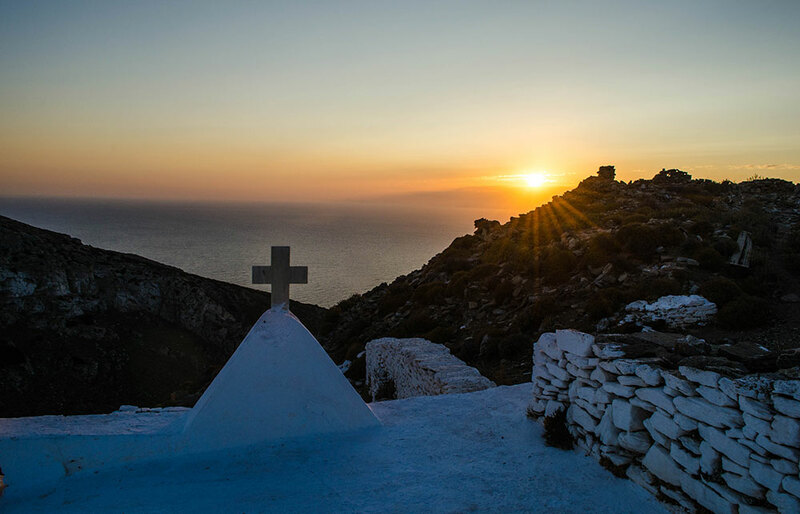 Panagia Kanala is the protector of the island and home to the miraculous image of Virgin Mary that every year attracts thousands of believers. Panagia Flampouriani: is an impressive church located in the bay of Flabouria. When you reach the church you will notice footprints (stone steps) from the beach to the church. According to tradition, these footsteps were left from Panagia Flampouriani, and are considered a major religious attraction. Panagia Stratilatissa: is a beautiful church situated about 3,5km away from Dryopida village. Inside you can admire an exquisite iconostasis. Chora, also known as Messaria, is the capital of Kythnos located on the northern part of the island. It is a very picturesque village with white houses, colorful flowers and charming churches, and picturesque squares, built during the 17th century. It is undoubtedly the most beautiful settlement of the island. 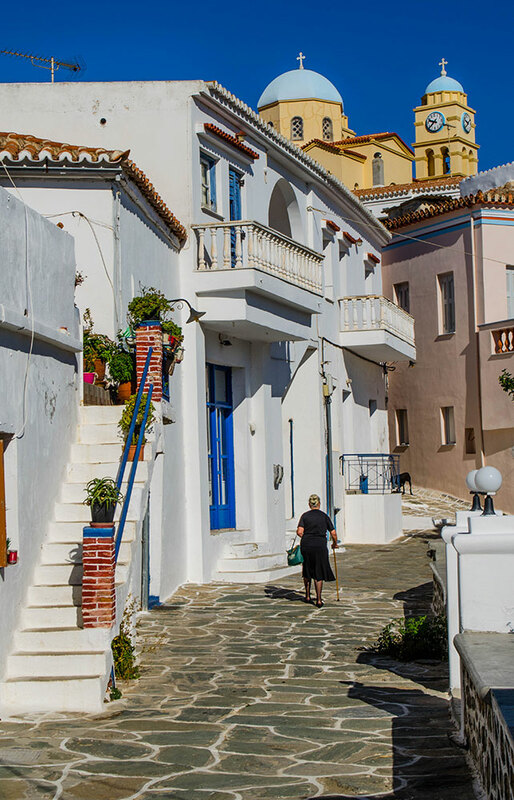 Chora’s petit squares blend their old charm with modernity for an unbeatable combination. 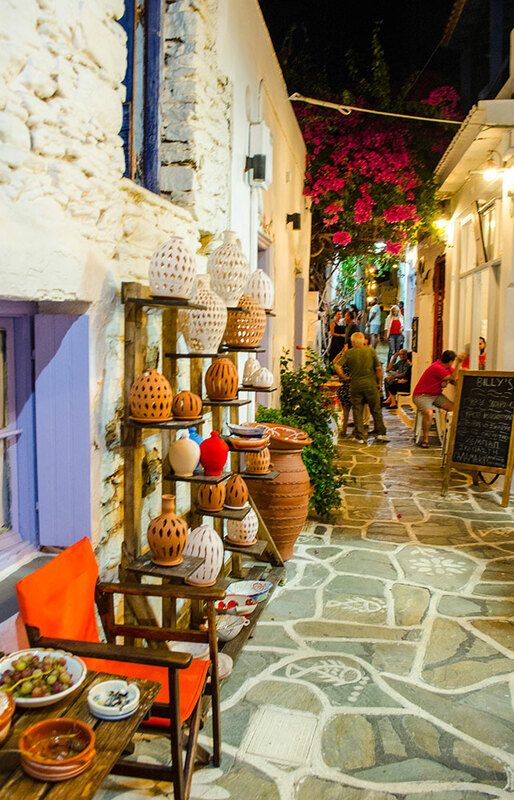 On their traditional cobbled alleys you will find quite modern restaurants, small shops, cafes and bars, meet hospitable locals and enjoy views to the surrounding scenery. Dryopida is the mountainous village located in the center of the island. Dryopida is particularly interesting architecturally, since it diverts from the distinct Cycladic architecture. It is comprised of two storey buildings with tile roofs and has been officially declared a Traditional Settlement. The main attraction of Dryopida is the Katafyki cave. Katafyki is one of the largest caves in Greece with fascinating labyrinthine corridors covering an area of approximately 3,500 sq.m. It functioned as a refuge for the inhabitants of the village during the years of pirate invasions, the Franks and the Turkish occupation, as well as the Second World War period. Other attractions worth visiting include the Byzantine Museum and the church of Agios Nektarios. Loutra is among the most famous places for SPA tourism in Greece. It is renowned for its thermal springs with therapeutic properties. This small seaside village is located 5km from the port and has become a popular resort that attracts many visitors. 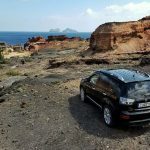 Here you will find the Spas of Kythnos with 14 baths and hydro massage, the archeological site of Maroulas, a small marina for sailboats, various accommodations and plenty of restaurants, cafes and bars. Merichas is the main port of Kythnos located on the west side of the island. This traditional village offers many amenities and attracts young people due to its nightlife. Contemporary bars, cafes and restaurants line the sea front offering local delicacies, lively atmosphere and mesmerizing sunsets. 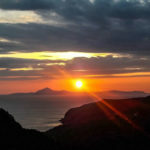 From here it is worth visiting the close by archeological site of Vriokastro. 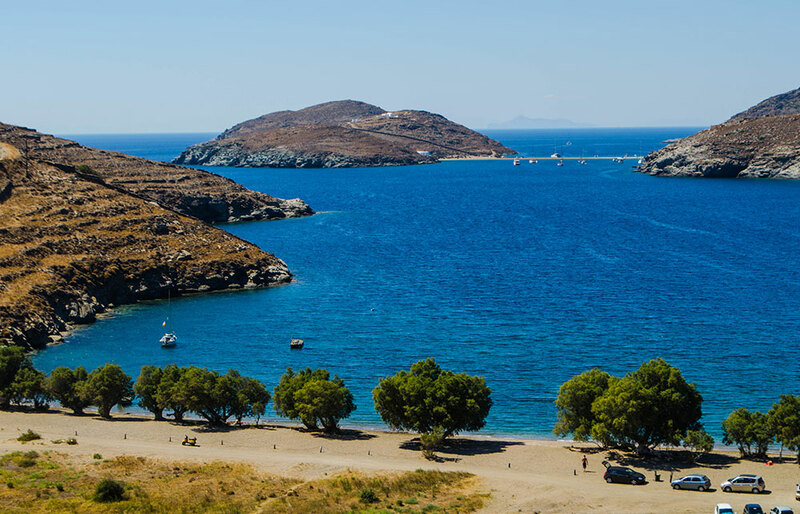 Kolona: is one of the most memorable beaches of the Aegean due to its characteristic shape - this stunning beach connects Kythnos to Agios Loukas islet by a narrow strip of sand with sapphire waters on both sides. 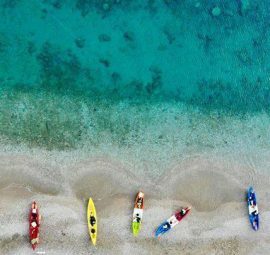 Its idyllic scenery attracts travelers who seek an exotic paradise to relax. The beach is not organized with only a few trees to provide natural shade. However there is a restaurant nearby where you can enjoy local delicacies and admire the magnificent view of the beach. Kolona is 3 km from Chora and can be accessed either by a narrow and at some points rather steep dirt road or by boat. Apokrousi: is long beach with sapphire waters about 3km away from Chora. In its fine golden sand you will find plenty of tamarisk trees providing ample shade and a nice onshore tavern, water sports, and beach bars. Apokrousi has been awarded with a blue flag and offers a relaxing oasis with a great view to the famous Kolona beach. 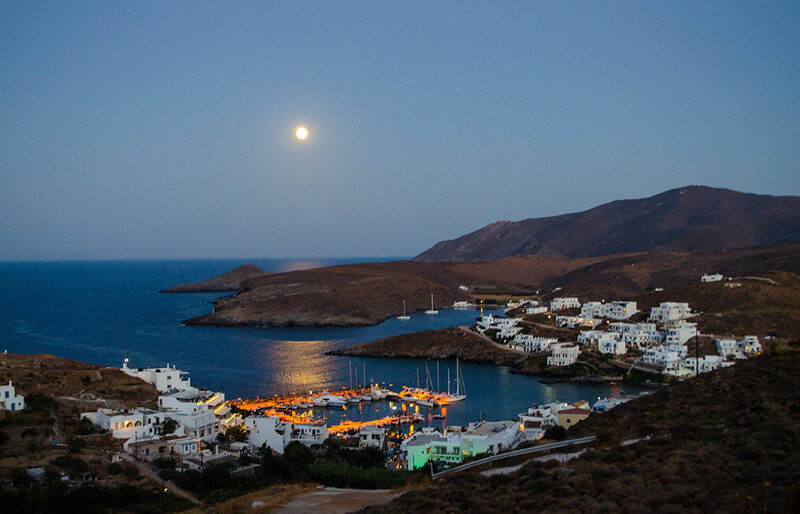 Kanala: is a serene beach situated south of Chora, the protector of the island. This small sandy and pebbly beach with crystal waters offers the ideal scenery to those looking for relaxation and tranquility. 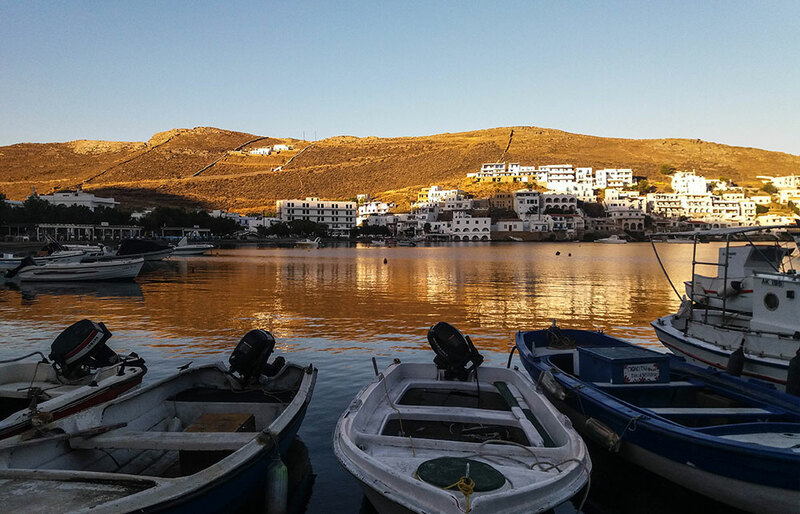 In the area you will find a few taverns and the idyllic monastery of Panagia Kanala, the protector of the island, with its unique atmosphere that it is definitely worth a visit. 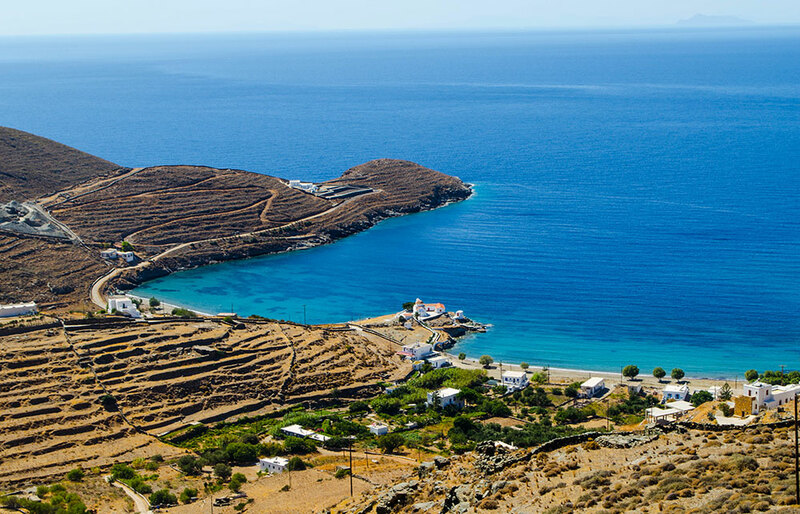 Loutra: is the main touristic resort of the island on the northeastern side of Kythnos. This charming sandy and pebbled beach with crystal waters is rather popular due to its therapeutic thermal springs, rich in minerals. One of the hot springs ends up in a natural pool made out of large rocks and offers a great chance to enjoy a night swim in hot water. Loutra is also a popular nightspot with lively nightlife. In the area you will find many amenities including accommodations, restaurants, shops and cafés, as well as several beaches on a walking distance that are great for swimming. 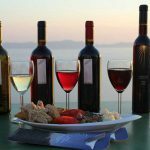 Among them, Agia Irini beach, located within 1 km from Loutra, stands out for its excellent fish restaurant and secluded, peaceful bay that is often preferred by yachts. 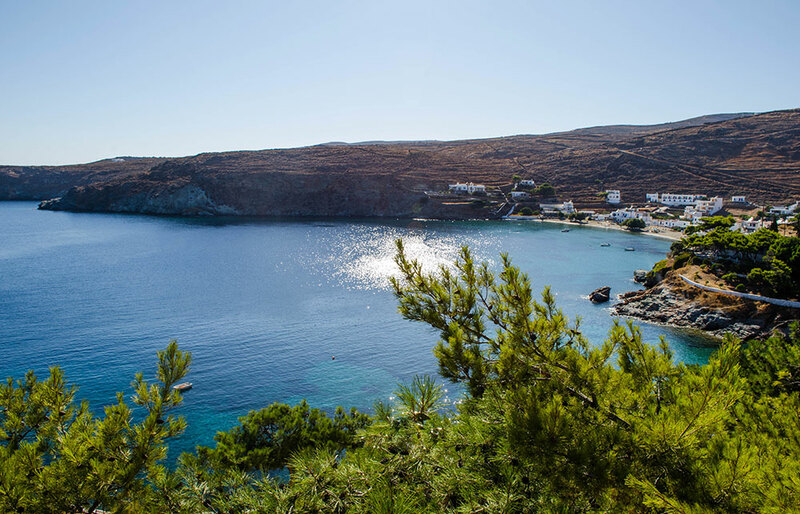 Agios Dimitrios: is a long quiet beach located in southern Kythnos. This quiet beach with thick sand and sapphire waters offers tranquility and serenity to its few visitors. 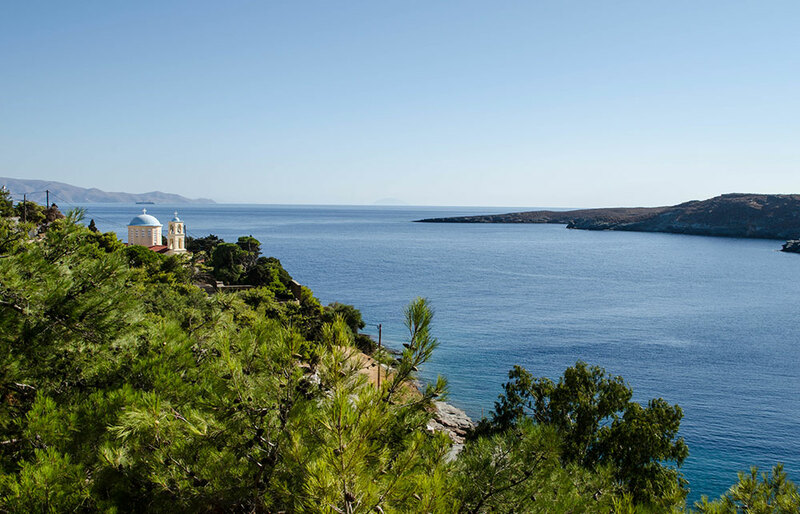 Nearby you will find a few accommodations, tavernas, and the seaside chapel of Agios Dimitrios, from which it was named after. According to mythology, Zeus used Kythnos central location, right in the heart of the Cyclades, to watch the birth of his son Apollo. As such, Kythnos is also known the island of Apollo. 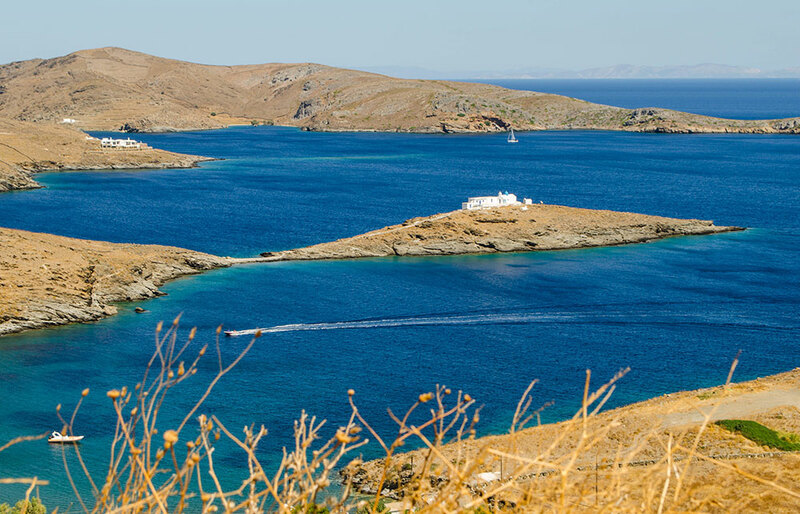 Ancient times: The first settlers of Kythnos were Dryopes that settled in the island in the 13th century. Kythnos owes its name to the leader of Dryopes, Kythnos, who became the first king of the island. Dryopes also gave their name to the picturesque village of Dryopida. In the 8th century the Ionians came to the island and the merchant flourished. In the 5th century Kythnos participated in the Persian wars and later on became part of the Athenian Alliance. Medival Years: Kythnos’ fate was similar to the rest of the Cyclades. First it became part of the Roman State and then moved under the Venetian rule and for several centuries suffered from pirate raids. During those years the island was known as Thermia due to its thermal springs. Ottoman Years: In 1537 the Turkish pirate Barbarossa attacked the island and destroyed anything that came in his way. Kythnos remained under the Venetians until 1617, when the Turks forced the Venetians out. During the Turkish – Russian war the island passed to the Russians. Greek State: In 1821 Kythnos joined the Greek Revolution and fought against the Turks. Under the first Greek King Otto, the island became a place of exile for political prisoners. During the Second World War, Kythnos suffered. The factories that were responsible for the economic prosperity of the village were abandoned and the locals turned to agriculture, raising animals and fishing. Agioi Apostoloi: are celebrated on June 30th at Dryopida. Prophet Ilias: is celebrated on July 20th in the central square of Chora. Dormition of the Virgin Mary: is celebrated on August 15th at Panagia Kanala, Panagia Nikous and Panagia Sratilatissa. Kythnia Festival: is a set of cultural events held every July and August at Chora. The events are organized by the municipality of Kythnos and include arts exhibitions, concerts, poetry nights, beach parties, shows and music events. 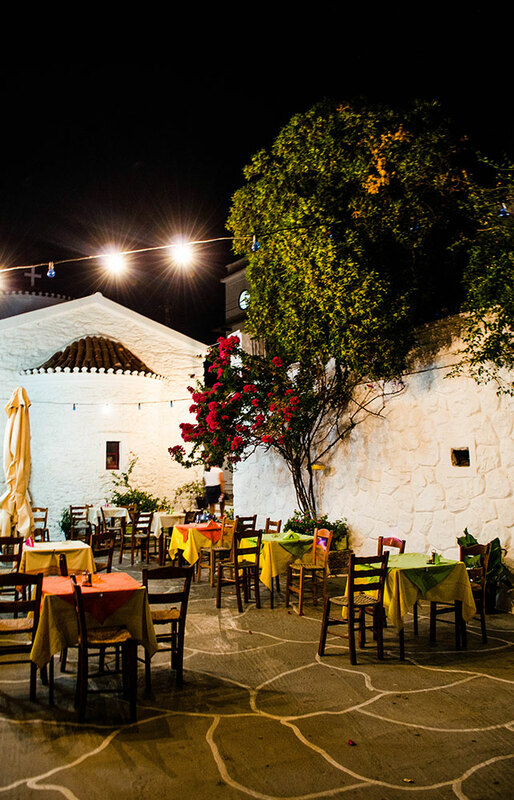 Sfougato: is a gastronomic festival centered on the cheeses of Kythnos that takes place every summer in Chora. Kounies (swings): is a traditional custom that takes place on Easter Sunday. A swing is set up in Chora’s main square in which boys and girls in traditional costumes take a swing. To push someone on the swing on this occasion is a commitment to marriage.